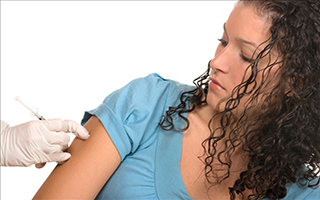 With flu season approaching, you may be considering getting a flu shot. But a new study's findings suggest that if you've recently taken antibiotics, you could be wasting your time and money on the vaccine. Fortunately, there's a solution. And if you have to get the vaccine, it could help make the shot more effective for you. What's more, it can work even if you haven't had any antibiotics. For those who are young and healthy, the flu may seem like no more than an annoyance. But worldwide, the disease causes a million severe cases and up to half a million deaths every year. For children, the elderly, and anyone whose immune system is weak, it can easily threaten your life. So if you decide to get the flu vaccine, it's important that it be as effective as possible to keep you well. In the past, flu vaccines have often been less effective for some of these vulnerable populations, especially the young and the elderly, and researchers weren't sure why. They simply didn't know enough about how vaccines interact with the immune system. This new study provides an important clue. The Emory Vaccine Research Center conducted this study and published their results in Cell Press in Immunity. The researchers found that the microbes in the guts of mice have a significant effect on their immune response to the flu vaccine. This suggests that the composition of the microbes in your gut may be affecting your response as well. The reason this is particularly important for people who have taken antibiotics is that these drugs wipe out not only bad bacteria, but good bacteria as well. This can have a major impact on the balance of microbes in your gut. This study also is significant in that it suggests scientists may be able to find the ideal balance for your gut microbes to make the flu vaccine as effective as possible. The senior study author, Bali Pulendran, said, "In the future, it will be important to determine the impact of antibiotic treatment on immunity to vaccination in humans and to study whether differences in the composition of gut microbes in different populations can impact vaccine immunity." Fortunately, there's a way to improve the balance of good bacteria in your gut and potentially create a more effective environment for the flu vaccine to prep your immune system. All you have to do is take a probiotic, such as Advanced Probiotic Formula. Even if you aren't about to get a flu shot, probiotics are a good way to help bring your system back in balance after you've taken antibiotics. But if you're getting the shot, they could be the difference between it keeping you healthy through the season or simply being a painful sting that doesn't do you any good.